Asbestos exposure is the overwhelming cause of Mesothelioma in the United States. Typically, asbestos exposure usually occurred in an occupation or work environment. It is also well established, however, that working near others using asbestos products and household exposures (exposure from family members and their work clothes in the home) are known causes of Mesothelioma. The majority of mesothelioma diagnoses could have been prevented because, as early as the 1930s, companies selling asbestos and asbestos products knew that asbestos was extremely dangerous and potentially deadly. Regrettably, many companies did nothing about it, and the effects of those decisions are killing people today. Our Firm is comprised of experienced trial attorneys who possess knowledge and familiarity with asbestos-related diseases. We believe that those injured by careless asbestos exposure have the right to fair recompense for their suffering, and we are committed to holding the reckless companies responsible. It’s no secret that asbestos is capable of causing dangerous, life-threatening health problems that can alter the lives of those exposed to it and their families. 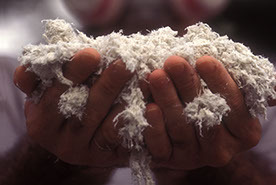 The onset of asbestos-related diseases, such as mesothelioma, often angers individuals who were unaware that employers and product manufacturers were putting them at risk for developing the disease. What’s worse is that the companies responsible for asbestos exposure knew that asbestos was extremely dangerous and potentially deadly, but continued to use it without taking precautions because of considerations of cost rather than safety. Not only was the decision to continue exposing people to asbestos careless and irresponsible, many employers refused to even take precautionary steps to reduce the amounts of exposure in the workplace. As a result, countless people have battled asbestos-related cancers, respiratory diseases, and many have died as a result of those illnesses. To make a claim for an asbestos related injury, it’s important to first get help from a qualified attorney with experience in cases that deal with asbestos exposure and mesothelioma. Though the results of each case vary, we work tirelessly to help ensure the best possible outcome for each person affected by a company’s negligence and asbestos exposure. If you or your loved one has been the victim of asbestos exposure and have been diagnosed with mesothelioma or another asbestos-related disease, please contact us immediately. Mesothelioma, one of the deadliest types of cancer, is most always caused by asbestos exposure. Known as malignant mesothelioma, it is the most life threatening of all asbestos-related diseases, and typically carries a poor prognosis following diagnosis. Mesothelioma has a long latency period and usually shows up later in life. It is not your fault that irresponsible corporations chose to look the other way when medical reports dating as far back as the 1930s confirmed the association between the use of asbestos and an incurable, deadly disease of the lungs. 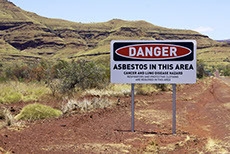 Instead, companies selling asbestos and asbestos products blatantly disregarded warnings concerning the hazards of asbestos in an effort to attain greater revenue; thus, prioritizing their bottom line over the well-being of workers and their families. We share in the outrage you feel against these companies that looked the other way. To find out how our Firm can guide you through this challenging time, please contact us today. A naturally occurring mineral fiber, asbestos is extremely heat resistant and exceedingly resilient. It’s for this reason that manufacturers began using asbestos in building materials, insulation, gaskets and packing, clothing, and items that cause friction, such as vehicle brakes and many others. In fact, since the late 1800s, thousands of products have been made with asbestos, including everyday products like toasters and coffee makers. By the 1930s, it was evident that inhalation of asbestos fibers was causing deadly lung disease years following initial exposure. In fact, asbestos fibers are so tiny, that they can be inhaled as dust from another person’s clothes or hair. Exposure to asbestos is known to cause asbestosis, lung cancer and mesothelioma. The diseases don’t appear immediately. There is a long latency period for all asbestos diseases, meaning that symptoms may not occur for many years after exposure. Due to the health danger that asbestos poses, few products are now available to consumers containing asbestos fibers. However, countless deaths have resulted due to contact with products that previously contained asbestos. If you have concerns about specific asbestos-containing products, please contact us with questions. Furthermore, if you believe that you were exposed to asbestos in the past, speak with your doctor immediately. Asbestos was an extremely common substance used in American manufacturing and industrialization throughout the twentieth century. Despite increasing scientific and medical warnings concerning exposure to asbestos in the workplace, many companies ignored the alarm bells that were sounding about the substance. Americans are still feeling the effects of negligent asbestos use today. Approximately 2,000 to 4,000 people per year are diagnosed with Mesothelioma. While there is no way of knowing each and every occupation that exposed individuals to asbestos, these are just a few of the hundreds (if not thousands) of professions where individuals were exposed: construction workers, shipyard workers, Navy servicemen, mechanics, engineers, railroad workers and many others. Individuals who are exposed to asbestos through a secondary source are at considerable risk for developing asbestos-related diseases. Secondary exposure to asbestos is no less dangerous than direct exposure, as asbestos fibers can be inhaled from the dust on the clothing of individuals who come into direct contact with them. Spouses and children of those who directly work with asbestos-containing products and are subjected to asbestos exposure through their loved one are at risk for developing asbestosis, lung cancer or mesothelioma – though these illnesses may not appear for decades following exposure. If you’ve been diagnosed with Mesothelioma, it’s probably because you were exposed to asbestos at some point in your life. You may not have known it at the time, as asbestos fibers are so small, that they can travel in dust on clothing and are easily inhaled or swallowed. The companies responsible for creating and selling asbestos-containing products knew of the dangers of asbestos and they should be held responsible for the injuries they caused. Our Firm wants to help you. We have the knowledge and experience necessary to properly litigate an asbestos case, and we are willing fight for your rights throughout the legal process. Since state laws often place time limitations on how long you have to file a case following a diagnosis of mesothelioma, it is important to seek legal assistance as soon as you are diagnosed. It’s imperative that when choosing an attorney, you pick someone who understands what you’re going through and who is qualified to aggressively handle your Mesothelioma case with your best interests in mind. Choosing a Mesothelioma lawyer requires asking the right questions, rather than just picking any legal representation. The firm you choose should have plenty of experience with cases similar to your own. You do not want to choose a legal representative with little knowledge of Mesothelioma and asbestos. Instead, opt for a qualified Mesothelioma trial lawyer with extensive experience in asbestos-related illnesses. Don’t be afraid to ask your attorney about previous cases and settlements similar to your own case. Do you know the procedural norm your law firm has with regard to Mesothelioma cases? In other words, make certain that the law firm you choose has the capabilities and resources to handle your case themselves, rather than outsourcing it to other legal professionals. Your attorneys should explain every step of the legal process to you and keep you informed of the details of your case. Our attorneys, for example, will outline the entire process for you, answer all of your questions and make sure you are only as involved as you need to be as your case progression. In the event that your case needs to be appealed, the last thing you want to have to do is leave the attorneys you’ve been working and building a relationship with, only to have to reacquaint yourself with new legal representative. You need someone who knows the ins and outs of your case to continue representing you if you have to make an appeal. Since many Mesothelioma patients are elderly and lack the strength to battle a life-threatening illness and navigate a lawsuit at the same time, they may leave the latter task to a trusted loved one. Often, it is the adult child of an individual diagnosed with Mesothelioma who takes on the responsibility of pursuing legal action against those responsible for a parent’s asbestos exposure. If your parent or loved one is suffering from asbestos-related Mesothelioma, it is important to help him find a qualified Mesothelioma trial lawyer. Mesothelioma cases may stretch over several months or years, and they usually include multiple defending parties, so it is crucial to find a legal representative with a solid record in Mesothelioma trial law. By assisting your parent or loved with finding a qualified Mesothelioma attorney, you allow him to spend more time focusing on his health and as little time as necessary actively spent in the litigation process. Please contact us today with your questions and concerns.